If you’re looking for some seasonal gift ideas or just something to take your mind off of the holiday frenzy, check out the following new titles that will transport you to a world away. You’ll find all these and mushc more in December at a neighborhood library near you. Originally published as a picture book in 1988, this classic book was sadly out of print for many years. Well, no more – Baby Says is back, now as a board book, and still a pleasure for parents and toddlers alike. The sparse text and lively illustrations tell the story of two brothers at opposite ends of a room. The older brother plays with blocks on the floor, while a curious baby boy watches intently from his crib. After repeatedly throwing his teddy bear on the floor to get his big brother’s attention, Baby finally gets what he wants when his brother takes him out of his crib and sits him on the floor by the blocks. Together, the boys come to enjoy each other’s company—but not before a few silly, giggle-inducing incidents occur! Did you enjoy James Patterson’s Middle School series? Some of those titles were Middle School, the Worst Years of My Life; My Brother is a Big, Fat Liar; and Save Rafe! The fun continues with this spin-off series told by Rafe Khatchadorian's dog, Junior. Things get a little ruff when Rafe has to take Junior to obedience school! Set in our world, spanning the near to distant futures, Stronger, Faster, and More Beautiful is a novel made up of six interconnected stories that ask how far we will go to remake ourselves into the perfect human specimens, and how hard that will push the definition of "human." Perfect for fans of Westworld and Black Mirror. An exhaustive look into the passionate love affair that led to one of the most infamous murders in 1920s England. The secret romance between Edith and Freddy Bywaters captivated and shocked a nation, as her love letters were introduced as evidence during their trial. They were both hanged. Freddy was demonstrably guilty; but was Edith truly so? In shattering detail and with masterful emotional insight, Laura Thompson charts the course of a liaison with thrice-fatal consequences, and investigates what a troubling case tells us about perceptions of women, innocence, and guilt. This Netflix series, adapted from Margaret Atwood's award-winning dystopian novel, tells the story of a fundamentalist Christian theocratic dictatorial society known as Gilead. Gilead has been built upon the ashes of the former United States of America and is ruled by a twisted fundamentalism in its militarized "return to traditional values." In this society, women are considered unworthy of choosing their own fates and men completely control every aspect of their lives. Women are forbidden every right, including the ownership of property and reading. A strict class system exists where "handmaids" serve as concubines and child bearers to members of the upper class who can't have children any longer due to the effects of wide-scale pollution. Season 2 continues the tale of Handmaid Offred, her pregnancy, and her ongoing fight to free her future child from the dystopian horrors of Gilead. New to the series? Check out The Handmaid’s Tale: Season One on DVD. 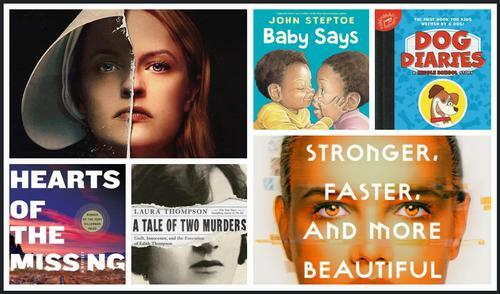 Check out these new titles coming to a neighborhood library near you in December! 1st-3rd grade reader and any + all adult!